In late December 2017, Yesh Din published its annual data sheet on law enforcement on Israeli civilians suspected of ideologically motivated crime against Palestinians in the West Bank. The figures presented in the data sheet are based on Yesh Din’s monitoring of over 1,200 investigations opened since 2005 by the Judea and Samaria (JS) Police, the Israel Police district in charge of the West Bank, following complaints filed by Palestinian crime victims. The data shows that only 3% of investigations of ideologically motivated crime against Palestinians have resulted in a conviction. In addition, only 8.1% of the investigation files monitored by Yesh Din during this period (94 of 1163 concluded files) have led to indictments. From the beginning of 2014 to the end of August 2017, Yesh Din monitored 225 new investigation files. At the time of publication, investigation and prosecutorial bodies had completed the processing of 185 of these investigations. 21 (11.4%) of these investigation resulted in indictments, and 118 (64%) were closed under circumstances attesting to police investigative failure. The rate of investigative failure is higher in the total number of cases monitored by Yesh Din since 2005, standing at 82%. The data points to a slight increase in the indictment rate in investigation files monitored by Yesh Din, together with a corresponding decrease in police investigative failure. However, the indictment rate in the total number of cases monitored by Yesh Din (all of which are investigated by the JS Police, both since 2005 and from 2014 to 2017) remain dramatically lower than the overall rate of indictment in the JS District during the corresponding timeframe (about 36.6% from 2014 to 2016). It is also lower than the national rate during the same time frame (about 15.3% from 2014 to 2016). This situation persists despite the fact that all cases monitored by Yesh Din concern ideologically motivated crime, which is particularly grievous. So far, criminal legal proceedings have concluded in 83 of the files that were monitored by Yesh Din and resulted in an indictment. Only 36 of these concluded with a full or partial conviction (43.4%). In contrast, 15 ended with a finding of guilt but no conviction (18.1%). In four of these cases, the defendants were minors. According to a 2012 study (Hebrew), only 5.3% of the cases adjudicated by Israel’s Magistrates Courts, and 1.2% of those adjudicated by the District Courts, end with this result. 15 proceedings ended with the charges withdrawn or canceled (18.1%), and five ended with acquittals (6%) – a much higher rate than the overall acquittal rate in criminal cases adjudicated by both the Magistrates and the District Courts. Another striking trend is the increase in the number of Palestinian crime victims who do not wish to file a police complaint. 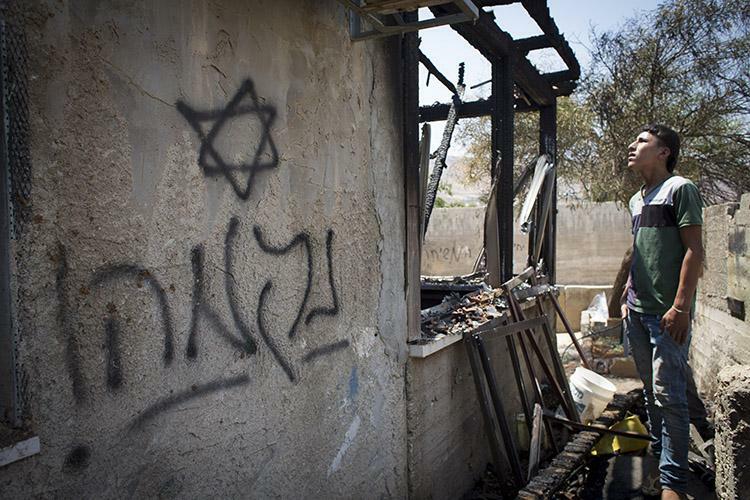 In 2016, Yesh Din documented 113 incidents of ideologically motivated crime against Palestinians and their property in the West Bank. In 48 of these cases (42%) the crime victims told Yesh Din they were not interested in filing a complaint with the Israel Police. This, compared to 30% of the victims in cases documented by Yesh Din between 2013 and 2015.